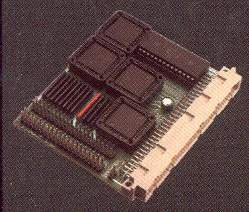 High Speed EIDE card which connects the the connector on the Z-IV Busboard from Elbox, dubbed Zorro IV. It provides two high speed IDE connectors for up to 16MB/sec transfer rates. This card can also handle large drivers without the need for patches because it splits them into virtual hard drives so that the Amiga thinks you have several hard drives connected to the controller.